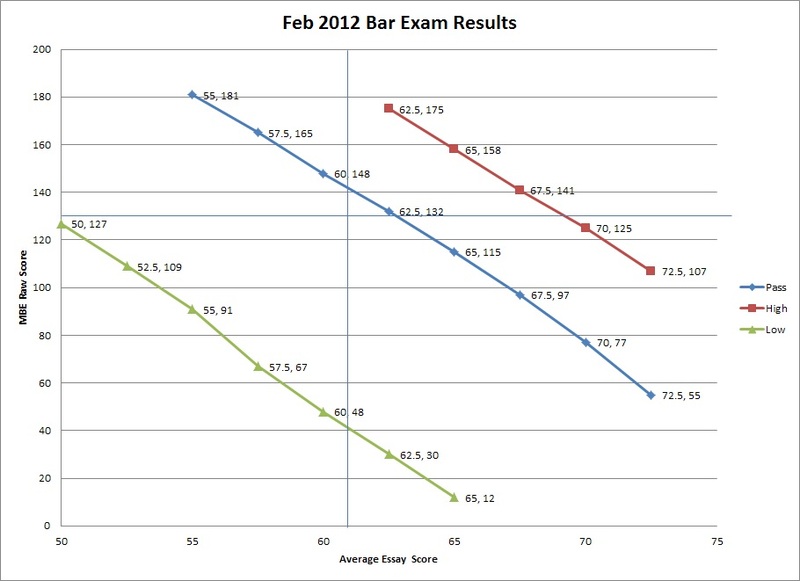 The California State Bar has just released the results to the February 2012 California Bar Exam and I am once again writing about how well one must due to pass. Different bar review companies offer percentage estimates ranging from 65% to 70%. 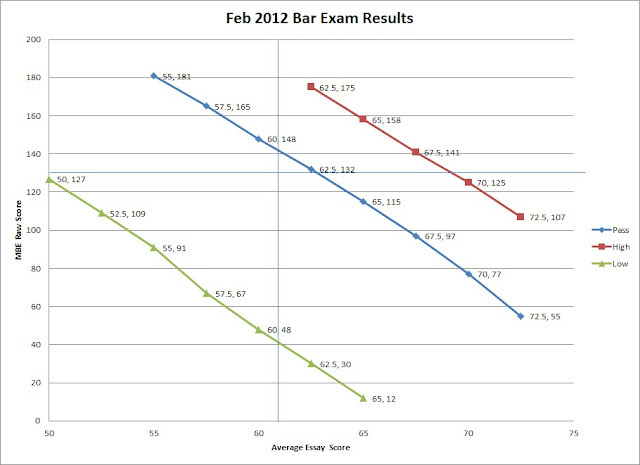 I tabulated some statistics from the February 2012 California Bar Exam and reached different results. The scaled written score is then multiplied by .65 to get the total number of essay points toward the final score. The second day of the Bar exam consists of 200 multiple choice questions on the Multistate Bar Examination (MBE). Notably, this MBE issue had a higher mean number of correct questions up to 122 last February and 127 in July to 128. This is probably because the exam was easier. As shown below, an exam taker could score an average of 70 on the essays (9 points above average) and would still need 77 MBE questions correctly answered which is higher than it has been in the last two administrations. On the February 2011 exam, an exam taker with an average essay score of 70 (ten points above average) would have to answer 75 MBE questions correctly to pass. Here is a chart that shows what I am talking about. The green line represents the 5th percentile of exam takers, the red line represents the 95th percentile of exam takers. As I have mentioned before, one of my theories is that February scores are, on average, lower, because fewer people decimate the exam with a score of 1600 or higher. Here, 326 people did that well, which is proportional with the number on the administration in July (570 of 8456). Sure some people did better or worse, but 90% of exam takers fall between those two lines. The blue line is set of passing scores showing the average raw essay on the x-axis and the average raw MBE on the y-axis. The horizontal line is the California average MBE raw score (128), and the vertical line is my guess as to the average essay score (61.1). Similar to February 2011, the average exam taker failed, but not by much. By my math if you scored a 62.5 as an average essay and 132 raw on the MBE, you would have passed the exam. Which is much more than was required in July 2011. Thanks for breaking down the scores of the bar exam. This is really helpful. Im not really great with numbers but what is the minimum essay score you would need to have gotten on the last July examination if you scored a 140 Raw on the MBE section of the test? This part of the blog also remain so useful and handy for me. I'd also agree with the certain information given in the same platform. Visit college paper for best papers. This is quite seriously open-handed of you to provide openly precisely what many people could possibly have advertised for an e-book to help with making some profit for themselves, mostly seeing that you might well have tried it in the event you considered necessary. Check is raeli jewellery for best Jewellery. The 810-440 Real Dumps available at Test4actual Go ahead and buy Expert verified 810-440 Dumps to Pass the exam at first attempt.